This study aims to apply rational emotive behavior counseling as an effort to reduce cheating behavior of high school students. The design of this study was conducted using a quasi experimental method approach with a pretest-posttest non-equivalent control group design research design. Data analysis techniques using Wilcoxon mached-pairs signed test, with the Asymp.Sig (2-Tailed) 0.028 <0.05, which shows a significant difference. The Z test value is -0.730 with the Asymp.Sig (2-Tailed) number 0.466, because of the Asymp.Sig (2-Tailed) value> 0.05, it can be concluded that there is no significant difference between the posttest value and the experimental group value with the control group, Ho is rejected and Ha is accepted which means that rational emotive behavior counseling is effective in reducing student cheating behavior. The study was carried out starting from January to March 2018, which took place at Darul Hikmah High School. Based on the results of the study, the researchers proposed several suggestions, among others (1) BK teachers, counseling rational emotive behavior can be applied by BK teachers to reduce student cheating behavior practically and can be easily applied; (2) for researchers furthermore, this research uses the pretest and posttest control group design research models, for the next researcher can use other research designs such as action research in BK, or other experimental research. Andrestia, M. (2010). 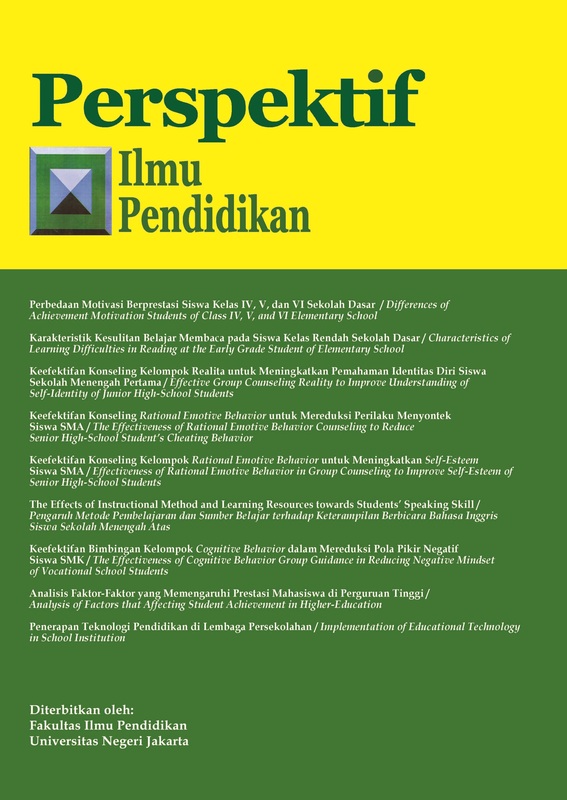 Pengaruh locus of control goal orientation terhadap cheating mahasiwa Fakultas Psikologi UIN Syarif Hidayatullah Jakarta. Skripsi. Jakarta: UIN Syarif Hidayatullah Jakarta. Anitasari, L. (2012). Hubungan stres dan perilaku merokok pada remaja. Skripsi. Malang: Universitas Negeri Malang. Bond, F. W., & Dryden, W. (1996). Why two central REBT hypotheses appear untestable. Journal of Rational-Emotive and Cognitive-Behavior Therapy, 14(1), 29-40. Corey, G. (2015). Theory and practice of counseling and psychotherapy. Canada: Nelson Education. Corey, G. (2012). Case approach to counseling and psychotherapy. Canada: Nelson Education. Dryden, W. (2014). Rational emotive behaviour therapy: Distinctive features. London: Routledge. Dryden, W. (2003). Reason to change: A rational emotive behaviour therapy (REBT) workbook. London: Routledge. Hartanto, D. (2012). Bimbingan & konseling menyontek: Mengungkap akar masalah dan solusinya. Jakarta: Indeks. variables. Journal of Educational Psychology, 55(4), 212. Santrock, J. W., & Curl, R. M. (2003). Adolescence (9th ed.). New York: McGraw-Hill. Setyani, U. (2007). Hubungan antara konsep diri dengan intensi menyontek pada siswa SMA Negeri 2 Semarang. Disertasi. Semarang: Universitas Diponegoro. vocational high school students. Prosiding 8th ICLICE 2017.